I love Primus even though I haven't listened to some of their previous albums, just back from the 90s and the Chocolate Factory they did (awesome). I wish there were more songs but I still love it, sounds awesome as always. The book is really cool, a treasure to hold on too! I will be wearing the shirt when I see them next month! I haven't looked at the poster yet. ATO records made it easy to order online and I was so excited to get my package in the mail. I haven't had any problems with anything. Love it! This album was a huge disappointment. There are seven tracks and only two that I would consider songs. Run of the mill Claypool rhythms that didn't seem particularly inspired. I was underwhelmed. Thanks to the shipping number I found out there was a problem whit my item I ordered. I called customer service and they were able to locate the problem. The city used for shipping was wrong. The lady on the other end informed me she would be in direct contact with shipping, and when the package is sent back the correct address will be placed on the package. Happy with customer service, not too happy with shipping. I figured when I spent over $100 on an item it would have been look at carefully. An Epic Masterpiece that rivals such works as 2112, Animals, and Joe's Garage. Primus at their absolute best! 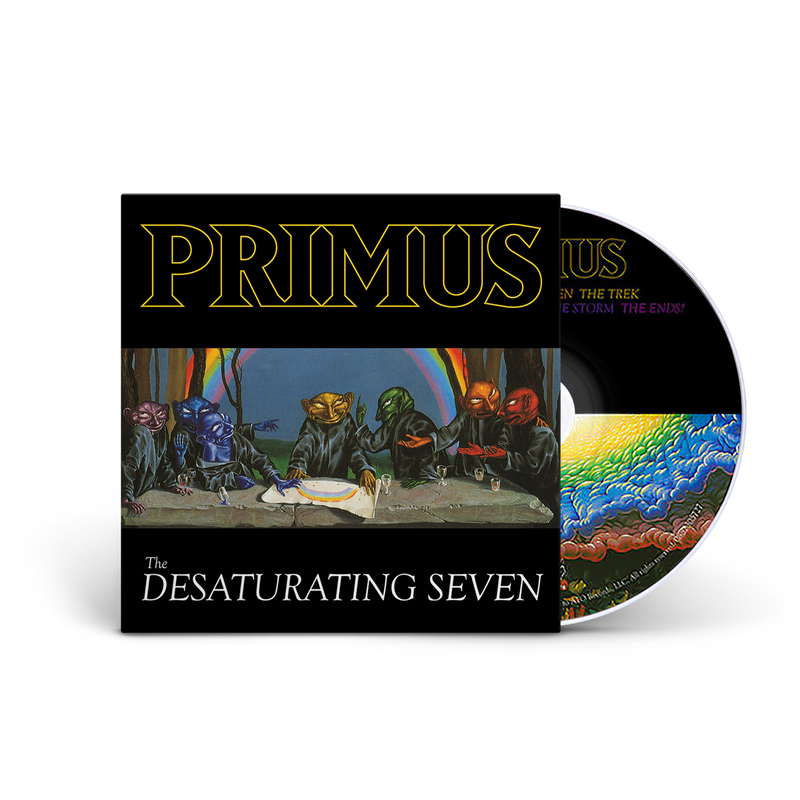 First off, I’d like to say The Desaturating Seven by Primus is a phenomenal album. I’m 100% please with Primus’ ability to put out such great music deep into their career. I’ve been a huge fan since 1991. Additionally, kudos to ATO records and soundkick for sending me this album in top notch condition through the mail and having it arrive 2 days before the official release date. I was very pleased! To ATO Records, soundkick, and especially Primus, keep up the fantastic work! Les and crew are back at it again with their unique sound that only Primus can pull off. Must have for all fans old and new. Follow the rainbow and this pot of gold will be yours! I'm biased, I have a huge hard-on for Les. I pray to Les every day while the sounds of his his divine bass sweep me into a plane of ecstasy. This new album is no different, and perhaps even the next level of worship for me. Primus has taken a musical shift toward prog rock, with sections echoing the memories of King Crimson and Frank Zappa at points. Listen to this album from start to finish as a complete work of art to do it true justice. Less harsh than Primus' previous albums, I think this album will bring in a wider listener base who would normally stray away from the abrasiveness and "odd" themes Primus normally covers. In fact, I'm pretty sure there is zero mention of methamphetamine in this album. Go, my Pachaderps, and buy this album. Awesome cd. Really grew on me more after each listen. Looking forward to seeing Primus perform this live.